A scooter is a style of two-wheeled motor vehicle with certain design characteristics such as a step-through frame, small wheels, automatic transmission and small engine. The definition is evolving as motorcycle designs change over time. Historically, a scooter was noted for a small engine, small wheels, a step-through design, a forward fairing with floor boards, and possibly under-seat storage. Modern scooters cover a broad spectrum of designs: step-through or step-over frames, small or large wheels, front fairings or floor boards, under-seat storage or not, and manual or automatic transmissions. Most scooters today feature automatic transmissions. At one end of the current market, the Vespa LX series reflects the scooters' historical antecedents: small wheels, floor boards, front fairing, inner fairing storage. At the other end, the Honda Big Ruckus featured no bodywork, floorboards or step-through frame, but was still classified as a scooter. The Piaggio MP3, with two front wheels (three wheels total) reflects the fluid nature of the scooter classification. Modern scooters have a wide range of engine displacements, from under 50 cc to over 799cc, and some have engine locations in stark contrast to classic scooter design (e.g. Yamaha T-Max 500, Suzuki Burgman 650, Gilera GP800). Generally the term "scooter" is not defined in law, as laws are based on characteristics such as engine size and power, and maximum speed. The United States Department of Transportation defines a scooter as having a platform for the operator's feet or has integrated footrests, and has a step-through architecture. A typical mid-1980s "twist and go" scooter. The classic scooter design features a "step-through" frame and a flat floorboard for the rider's feet. This design is possible because the scooter engine and drive system transferring power to the rear wheel is attached to the rear axle or under the seat. Unlike a motorcycle, where the engine is mounted on the frame, this front-hinged arrangement allows the engine to swing vertically together with the rear wheel. Older Vespas, most vintage scooters and some newer retro models have axle-mounted engines with a manual transmission and the gear shift and clutch controls built into the left handlebar. Most newer scooters use a Continuously Variable Transmission (CVT). Unlike most motorcycles, scooters usually feature bodywork, including a front leg shield and body that conceals all or most of the mechanicals. There is often some integral storage space, either under the seat, built into the front leg shield, or both. Most modern motor scooters have smaller wheels than motorcycles, 8 to 12 inches in diameter, though maxi- and big-wheel scooters may have larger wheels. Most scooters have smaller engines than motorcycles, 30 cubic centimeter to 250 cc with a single cylinder, though larger models have twin cylinder 400 to 650cc engines. Most jurisdictions have no legal definition for "scooter". Most states and countries classify scooters having engines smaller than 50cc as mopeds, and subject them to lower safety restrictions and licensing fees. Scooters above 50cc are usually legally considered motorcycles, although some states have an in-between definition for motorized bike for scooters and motorcycles between 50 and 150 cc. Until recently, most modern motor scooters came with air-cooled 2-stroke engines with automatic Two stroke oil injection although some of the higher spec small ones and large ones are water cooled such as the Honda FC50 or the 2002 Yamaha YQ50s. Scooters increasingly have four-stroke engines to meet stricter emissions controls. Trends around the world have seen new variations on the classic scooter. A common variation, the big-wheel or commuter-style scooter features wheels as large as a motorcycle. Popular models of the commuter-style bike include the Aprilia Scarabeo models, the Piaggio Liberty/LT models, and the Taiwanese Kymco People models. Four-stroke scooters which favor a classic vintage look include the Genuine Buddy and Stella models and Flyscooters Il Bello model. High-end scooter models now include comprehensive technological features including cast aluminum frames, engines with integral counter-balancing, and cross-linked brake systems. Some of these scooters also have comfort features such as an alarm, start button, radio, windshield, heated hand grips and full instrumentation (including clock or outside temperature gauge). In an effort to reduce emissions, there are now LPG powered scooters that run on liquefied petroleum gas (LPG) instead of gasoline or diesel. High-powered electric road scooters are on the horizon since small electric motorcycles like the Vectrix, e-max, and the eGO have been released. Scooter-like traits began to develop in motorcycle designs around the 1900s. In 1894, Hildebrand & Wolfmueller produced the first successful two-wheeler, with a step-through frame. Its fuel tank was mounted on the down tube, its parallel two-cylinder engine was mounted low on the frame, and its cylinders moved fore-and-aft. It was water-cooled and had a radiator built into the top of the rear fender. It became the first mass produced and publicly sold powered two-wheel vehicle, and among the first powered mainly by engine rather than foot pedals. Maximum speed was 25-30 mph. The rear wheel was driven by pistons similar to those in a locomotive. Only a few hundred such bikes were built, and the high price and technical difficulties made the venture a financial failure for both Wolfmüller and his financial backer, Hildebrand. In France, the Auto-Fauteuil was produced since 1902. In the United States, the Motoped is believed to be the first scooter to enter production, in 1910. Since 1914, the Autoped Company of Long Island City, New York produced a compact scooter for short trips. The driver stood on a short platform with 15-inch tires. After riding, the steering column, which contained all operating controls, was folded over the platform to store the scooter in a compact space. The engine was an air-cooled, 4-stroke, 155 cc engine over the front wheel. The bike came with a headlamp and tail lamp, a Klaxon horn, and a toolbox. Developed during wartime and gasoline rationing, it was quite efficient, but did not achieve widespread distribution. Salsbury's Motor Glide was a tiny motorbike built in 1936 by E. Foster Salsbury and inventor Austin Elmore. It had an enclosed body and an automatic transmission. It was such a success that in 1938 Salsbury attempted to license the design to several European manufacturers including Piaggio. The Motor Glide was the first depression era scooter, and set the standards for all later models. It inspired production of motor scooters by Powell, Moto-scoot, Cushman, Rock-Ola, and others. Salsbury produced the first automatic scooter with a continuously variable transmission (CVT). The Cushman Company produced motor scooters from 1936 to 1965. Light, compact, and rugged, they were widely used by the US military in World War II and as an alternative to automobiles in the years before and after the war. Cushmans were easy to ride and had an automatic clutch which allowed the rider to twist the right grip to go and step on the pedal to stop. The step-through design and ease of operation made it popular with men and women alike. Cushman claimed an efficiency of 75 miles per gallon, and a penny-a-mile operating cost. The scooters usually weighted about 250 to 335 pounds and some had as much as 9 horsepower. The most successful Cushman model, the Eagle, was produced for about 16 years. With its exposed engine and top tanks, it resembled a motorcycle. Other Cushman models used a traditional step-through design of most motor scooters. One of the most famous was the “Model 53”, a military model from the WW2 era. It was designed to be dropped by parachute with Army Airborne troops, so it became known as the “Cushman Airborne”. It was also used around military bases for messenger service. The Mitsubishi Silver Pigeon was a scooter largely made of warplane wheels and discarded warplane parts left over from WW2. It eventually shared popularity with the Fuji Rabbit, a motor scooter produced in Japan by Fuji Heavy Industries from 1946 to 1968. Production of the initial model, the S-1 began in 1946, some six months before the Vespa and was largely inspired by scooters used by American servicemen during and after WW2. Fuji Rabbit were the first Japanese-made scooters that could exceed 60 mph. Later models were among the most technologically sophisticated of their era, featuring electric starters, automatic transmissions and pneumatic suspension systems. As the Japanese economy expanded, demand for scooters shrunk, and Fuji diversified into automobiles in 1958. Although less known outside Japan, the Fuji Rabbit became a symbol of nostalgia in Japanese pop culture. The Piaggio Vespa became post WW2 standard for scooters around the world for 35 years. Patented in April 1946, it used aircraft design and materials. D’Ascanio's 98cc scooter had various radical design concepts, including a sleek, stress-bearing structure. The gear shift lever was moved to the handlebars for easier riding. The engine was placed near the rear wheel, eliminating the belt drive. The typical fork support was replaced by an arm similar to an aircraft carriage for easier tire-changing. The elegantly styled body protected the driver from wind and road dirt, and bore little resemblance to uncomfortable and noisy motorcycles. The smaller wheels and shorter wheelbase provide improved maneuverability through narrow streets and congested traffic. Combining the best elements of automotive, aeronautical and motorcycle design, the Vespa quickly became an icon of design and economy. The name reportedly originated when Piaggio's president upon seeing the prototype, remarked Sembra una vespa, "It looks like a wasp". Months after the Vespa, in 1947, Innocenti introduced the Lambretta, beginning a rivalry with Vespa. The scooter was designed by Innocenti, his General Director Guiseppe Lauro and engineer Pierluigi Torre. It debuted in 1947 at the Paris Motor Show. The Lambretta 'A' went on sale on December 23rd 1947 and sold sold 9,000 units in one year. It was efficient at a time when gasoline was severely rationed. It had a top speed of 45 mph, and a direct air-cooled engine with 123 cc. The Lambretta was named after the region where the factory stood. The Maicoletta motor scooter of the 1950s was one of the largest produced in that era. The engine was a single cylinder 247cc piston port 2-stroke (277 cc for use with a sidecar), with four foot-operated gears and centrifugal fan cooling. The tubular frame was built on motorcycle principles, with long travel telescopic forks and 14-inch wheels. The Maicoletta had a top speed of 70 mph which was comparable with most 250cc motorcycles of the time. After WW2, Heinkel stayed in business by making bicycles and motorbikes. The Heinkel Tourist was a large and relatively heavy touring scooter produced in the 1960s. It provided good weather protection with a full fairing and the front wheel turned under a fixed nose extension. It had effective streamlining, perhaps thanks to its aircraft ancestry. Although it had only a 175 cc 4 stroke motor, it could sustain speeds of 70 mph. Heinkel scoooters were known for their reliability. Zundapp Bella was the most popular German scooter manufacturer in the 1960s. It was in production for about ten years, in two engine sizes, 150 cc and 200 cc. They could perform all day at a steady speed of 60 mph. Extremely reliable and very well made, many of these scooters still exist today. In the US, Harley-Davidson produced the Harley-Davidson Topper scooter from 1960 to 1965. It had a fiberglass body and a pull-cord starting mechanism. It had a 165cc DKW gasoline engine, a variant of the DKW 125 cc gas motor from post WW2 Germany. Its maximum speed was 40 mph, and had no front brake. Very few units were sold getting Harley-Davidson out of the scooter production business. Smaller models, including the Shortster and Sprint, produced by Italian manufacturer Aeronautica Macchi S.P.A.. were in America under the Harley-Davidson name. The Triumph Tigress was a luxury scooter made in England in 1962 with good performance and handling like a motorcycle, drawing on Triumph's long experience of building fast motorcycles. It was sold with a 175 cc 2-stroke single engine, or a 250 cc 4-stroke twin. Both had four foot-operated gears. The 250 twin sold well and could reach 70 mph with efficient suspension and good roadholding despite having only 10-inch wheels. But the Tigress broke often. The BSA Sunbeam was an identical machine with the BSA label. 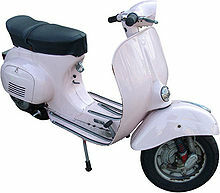 In the 1980s new versions of scooters began to be released and become popular, especially in Japan and far-east Asia. This style of scooters began to reflect that of larger, sporty, higher-performance motorcycles of the time and the trend has continued till now. With the release of the Honda Ruckus, new trends towards dirt-bike scooters are just beginning. 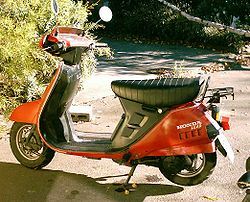 In 1988, Honda introduced a large, touring scooter design, the 250 cc Honda Helix (also called Spazio, Fusion or CN250). Although it was bulky to handle at low speeds and was derisively called a "Barcalounger on wheels", it was designed for riding long distances in comfort. Now nearly all major scooter manufacturers produce such models, called "maxi", "GT" or "touring" scooters. The largest scooter made is now the 650 cc Suzuki Burgman, known in Japan as the Sky Wave. The classic styling of the Vespa never lost its popularity, and remains the most popular and most imitated scooter design. Almost all manufacturers now carry both a classic/retro model and a sporty/modern model. In many parts of the world, such as Asia and Europe, motor scooters are a popular form of urban transportation due to their low cost and easy driving position. In fact, in many nations in Asia, scooter sales growth outpaces automobile sales growth. For many people, a motor scooter is the family vehicle until sufficient funds to purchase an automobile are amassed, although in crowded cities, scooters can be preferred over automobiles regardless of cost, due to parking, storage, and traffic issues. In Taiwan, road infrastructure have been built specifically with two wheelers in mind, with separate lanes and intersection turn boxes. In Thailand, scooters are used for street to door taxi services, as well as for navigating through heavy traffic. Motor scooters are popular because of their size, fuel efficiency, weight, and typically larger storage room than a motorcycle. In many localities, certain road motor scooters are considered by law to be in the same class as mopeds or small motorcycles and therefore they have fewer restrictions than do larger motorcycles. In the last few years, new technology has emerged, such as fuel-injected scooters, which are efficient and durable. Aprilia released the SR Ditech in 2001. The fuel consumption of this gasoline direct injection scooter is one liter of fuel for 117 mpg. Later on, more brands, such as Derbi and Peugeot, started using direct injection systems for their scooters. Due to new environmental laws, scooters had to change because the Euro3 standard allows only four-stroke engines. Some scooter drivers don't agree this is a good solution because they are used to two-stroke motors. Also, while four-stroke engines generally grant sufficient performance in sizes from 100 cc upward, 50 cc four-strokes tend to have barely enough power to drive at city speeds. China has become the largest manufacturer of scooters, producing over 50% of the world's supply. With lower prices and better quality control, China is now making scooters that meet strict US DOT & EPA standards. Manufacturers such as Flyscooters from USA and Ricardo Motors from Mexico meet the very strict California Air Resources Board's requirements. Some brands imported from China and known for their affordability, but sometimes questionable quality, are: Baron, CF Moto, Genuine, Longbo, Motofino, Qlink, Roketa, SunL, Tank, and United Motors. In the 2000s, scooters have gained popularity in Latin America, specifically in Puerto Rico. Another trend in the USA and elsewhere sees larger scooters, called maxi-scooters, with engines ranging in size from 250 cc up to the latest 839 cc machine (the Gilera GP 800) and using larger frames than the normal size scooters but not necessary big displacement. This trend began in 1985 when Honda introduced the CH250 Elite/Spacy, and continued with the 1999 introduction of the Suzuki Burgman 400. A few years later, Suzuki launched the Burgman 650. Honda (600 cc), Piaggio, Yamaha, Aprilia, Kymco (700 cc) and others have also introduced scooters with engine displacements ranging from 400 to 850 cc. Honda's PS250 or Big Ruckus defies common scooter classification in that its step-through is high and the bike features no bodywork but rather a motorcycle-like exoskeleton. The more advanced (and expensive) maxi-scooters differ from traditional scooters in that the engine is mounted on the frame, as opposed to the swing-arm. This arrangement can improve the handling, by allowing the centre of gravity to be moved forward and making fewer demands on the rear shock absorber(s). A final drive is necessary to connect the clutch assembly to the rear wheel. This trend toward larger, more powerful scooters with fully automatic transmissions is matched by an emerging trend in motorcycle design that foreshadows automatic transmission motorcycles with on-board storage. This is exemplified by the Aprilia NA 850 Mana automatic-transmission motorcycle that provides built-in storage for a full-face helmet. This page was last edited on 26 November 2010, at 22:38.